I bet learning German is easy. Vocabulary is easy to learn, but when it comes to grammar, it's entirely different. Romance languages and other Germanic languages (Scandinavian cluster, Dutch, etc..) are actually easier to learn than German. Because English words like fireman and pineapple are so much more imaginative. I wonder how "Ananas" relates to pineapple though. Probably the same way as "apple" relates to the fruit. Hello. :) I'm half German and I like this cartoon. It's true that German nouns seem very simply constructed! Some of the 'scary-looking long words' are just 3 or 4 small words put together. Glad you like it! I do enjoy German, not least of all because of its hilarious word combinations. I've got a good one. Living in Graz atm, and there's a Schloss on the Berg in the center of town. You get three guesses what they call the Berg. You're not being pedantic, you're just doing your job! Yes, it should be "words-book." I will add "dust sucker" to the list for Part 3! I'm German and what I love about German is that you can express almost everything precisely using ordinay words so that everybody can understand what you are talking about even not knowing a thing of the materia. To give an example. I work in the air line business and whenever a plane takes off or lands a messages is send so that everybody is informed. This messages in English is called "movement". Quite logical but it can mean an endless forms of movemnts that do have nothing to do with air planes. 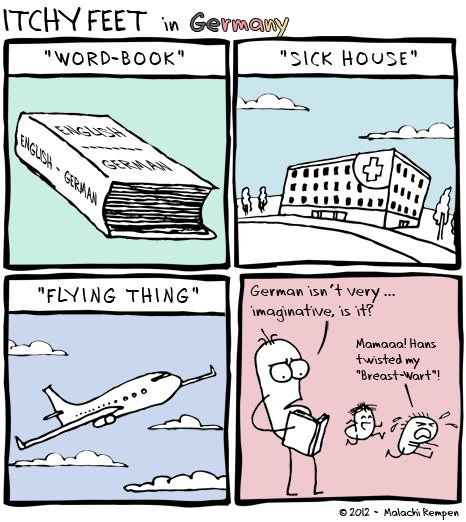 The German word (that hardly anybody uses) is Flugbewegungsmeldung. Looks scary, doesn't it? But it's a composite of the words Flug-flight, Bewegung-movement and Meldung-messages. All of these words are common and known to ordinary people so everybody would know what it's all about. And there are much more examples like this. This is wonderful - I think it needs to be a comic of its own!